Line a baking tray with wax paper. Skewer the flat side of each gumdrop with a toothpick. 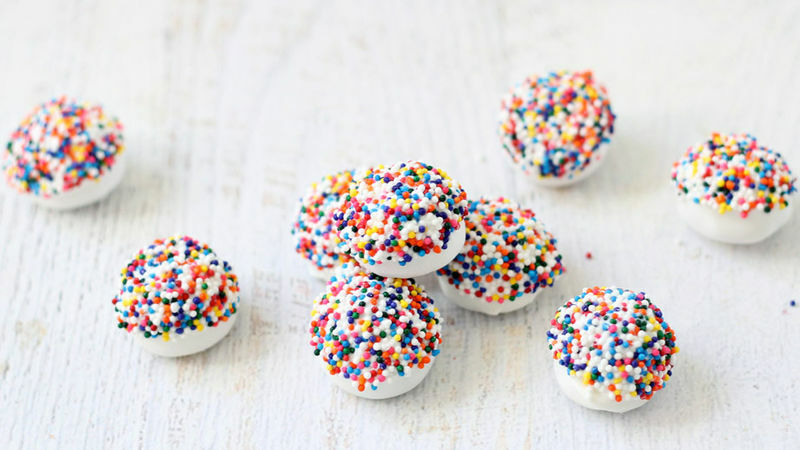 Pour the rainbow nonpareils sprinkles into a small dish and set aside. Place the candy melts and vegetable shortening in a microwave-safe container. Microwave at 70 percent power for 90 seconds. Stir and continue microwaving at 15 second intervals until fully melted and smooth. Hold the toothpick and submerge a gumdrop into the melted candy melts, completely covering the gumdrop with the melted candy. Tap the toothpick on the side of the container to remove excess candy melt, then immediately dip the top of the gumdrop into the rainbow nonpareils. Rest the gumdrop sprinkle-side down on the baking tray. Repeat with the remaining gumdrops. Let the candy melts dry to the touch, about 10 minutes. Carefully remove the toothpicks. If you like, dab a bit of leftover melted candy melts to fill the holes left by the toothpicks. Let the gumdrops dry fully, about 30 more minutes.